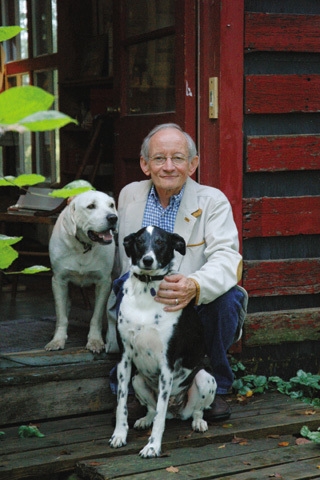 Ted Kooser and friends at his home near Garland. UNL Publications and Photography. Ted Kooser, 13th Poet Laureate Consultant in Poetry to the Library of Congress, will read from his works and discuss poetry in a special Nebraska Lectures event Feb. 8. The event, co-presented by the University of Nebraska-Lincoln and the City of Lincoln, begins at 7:30 p.m. in the Lied Center for Performing Arts, 301 N. 12th St. The event is free and open to the public on a first-come, first-seated basis. UNL student Collin Sullivan will give the keynote address Jan. 17 at UNL's ceremony for the national holiday honoring the Rev. Martin Luther King Jr.
"A Love of Place" is the theme of the installation of the sixth president of the University of Nebraska. James B. Milliken will be formally installed Jan. 27 in Omaha; a series of events over two days and four cities will share the installation celebration with the people of Nebraska. Events will feature a discussion panel, receptions, the arts, traditional academic ceremony and fellowship. Lincoln photographer Michael Forsberg will share his journeys with sandhill cranes in the next Paul A. Olson Seminar in Great Plains Studies Jan. 19. The Lied Center has expanded its programming to include the UNL East Campus for the first time, staging in the Great Plains Room of the Nebraska East Union as part of the Lied Center's 2004/2005 season. Joe Ruffo, retired UNL chair of Art and Art History, and Judith Burton, former MFA graduate, will be featured in "Objects and Atmosphere," a two-person show at Modern Arts Midwest. The show runs through Feb. 1. Two of the greatest voices of the folk music era perform together in concert Jan. 15 at the Lied Center. Odetta, whose influential music career has been an inspiration for over 50 years, and Richie Havens, who was the opening act at Woodstock, will each perform works from their latest CDs as well some of the beloved standards from their lengthy careers. The concert begins at 7:30 p.m. The Mary Riepma Ross Media Arts Center, Nebraska ETV and Emerging Pictures present a screening of a 100-minute version of a four-hour PBS series on boxer Jack Johnson at 7 p.m. Jan. 13 at the Mary Riepma Ross Media Arts Center. Admission to the high definition screening of Ken Burns's new film is free and open to the public. Continuing through Jan. 20 at the Mary Riepma Ross Media Arts Center are Undertow and The Machinist. John and Jason Shaw will present a free concert of old-time fiddle music, bluegrass, and jazz at 6 p.m. Jan. 19 in the Lied Center's Johnny Carson Theater. This event is part of the Lied Center's Free at 6 series. The University of Nebraska Press invites the university community to the American Association of University Presses annual Book, Jacket, and Journal Show, on display through Jan. 19 in its Haymarket offices. Award-winning designs from across the country will be exhibited, including some from UNP. The free public display is open weekdays from 8 a.m. to 5 p.m. at 233 N. 8th St. The School of Music will host the 18th annual Winter Festival for Winds and Percussion Jan. 21-23. Thousands of Nebraskans took their treasures to Omaha last July to the Antiques Roadshow appraisers. The best of those finds are featured on three one-hour episodes of the PBS hit series running Jan. 24, 31 and Feb. 7, at 7 p.m. CT and repeating Jan. 27, Feb. 3 and 10 at 8 p.m. CT on the Nebraska ETV network. We hit one out of the park!